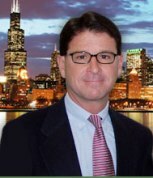 Mark is a former equity partner, shareholder, Officer, and Director of the large Chicago law firm of Pretzel & Stouffer, Chartered where, from 1987 to 2002, he concentrated his practice of law in defense litigation, principally in the areas of professional liability, products liability, and construction accident claims. Before going into private practice at Pretzel & Stouffer, Mark was a Cook County, Illinois Assistant States Attorney, where he worked in the Civil Actions Bureau, Federal Litigation Division, defending the County and its employees in Section 1983 civil rights litigation. Over the years, Mark has successfully tried cases to verdict in both jury and bench trials, in both state and federal court, defending his clients in medical malpractice, products liability, premises liability, vehicular liability, Realtor E&O, civil rights, and construction accident cases. First, as an Assistant States Attorney fresh out of law school, Mark tried civil rights cases in Federal Court. Since entering private practice in 1987, he has litigated, mediated, arbitrated, and tried hundreds of professional liability cases involving medical, legal, realtor, accountant, and insurance broker's malpractice He has similarly handled various other types of defense litigation in the areas of products liability, construction accidents, premises liability, and vehicular liability. Over the course of the last 25 years, much of Mark's litigation practice has been devoted to the defense of medical professionals, medical institutions, and medical devices/products. He has defended scores of doctors in the fields of psychiatry, orthopedics, OB-GYN, internal medicine, pediatrics, neonatology, oncology, neurology, radiology, anesthesiology, emergency medicine, and cardiology. He has also defended nurses, physical therapists, CNAs, LPNs, a cytotechnologist, and other allied healthcare providers. In addition, he has also developed a particular expertise in defending nursing homes, HMOs, and hospitals as well as the employees of these institutions. Regarding medical devices and other medical products, Mark's litigation experience includes the defense of medicines and their makers, blood products, and spinal fusion devices. Hence, for personal injury cases stemming from many varied causes, Mark has substantial human anatomy experience in virtually all areas of human anatomy especially brain injury claims and associated intangible psychological injury claims such as post-traumatic stress disorder, depression, etc. In defense of product designers, manufacturers, suppliers and distributors, Mark's comprehensive litigation experience in numerous lawsuits encompasses medical devices, medicines, punch presses, power tools, hand tools, propane gas tanks, trenching/digging machines, conveyor belt systems, amusement park rides, motorcycle wheels, and seating products in both sports stadiums and vehicles. Whether the plaintiff's theory of recovery sounds in warranty, negligence, and/or strict products liability for an alleged unreasonably dangerous product or alleged failure to warn of such danger, Mark has extensively litigated all such theories. Whatever the widget and whatever the injury, Mark's vast experience in products liability litigation, coupled with his experience in medical injury litigation and other personal injury cases, serves as a broad and solid foundation for him to ably defend the accused in this field of law. In the building/construction field, Mark has extensive litigation experience from cases he has managed and tried concerning various construction accidents and injuries to construction workers, as well as mechanic's lien litigation. He has defended general contractors, subcontractors of all tiers and of all kinds, steel erection companies, demolition companies, and excavating companies. In the field of real estate law, Mark has broad experience defending Realtors and real estate companies in professional liability or E&O malpractice cases bought by disgruntled house buyers. His experience in this regard encompasses the defense of claims under the Illinois Real Estate License Act, the Illinois Consumer Fraud and Deceptive Practices Act, and common law claims of negligent misrepresentation and fraud. Mark has also successfully represented Plaintiff house buyers against a Realtor and large real estate brokerage company proving violations of the Consumer Fraud Act and the Illinois Real Estate License Act based upon the fact that a house advertised as Brand New had sustained flood water damage, which the Realtor knew about but failed to disclose. In vehicle liability litigation, Mark's wide-ranging experience is comprehensive. Mark has defended automobile drivers, bus drivers, truck drivers, cab driver, ambulance drivers, medivan drivers, police officers in high-speed pursuit cases, as well as other drivers and their companies.